Are Radiant Barriers Cost Effective in New Homes? Radiant barriers are cool! Well, actually they get quite warm, but they help the space below them stay cooler when used on a roof assembly above an unconditioned attic. They can drop the temperature of an attic about 20° F.
But are they cost effective? How much in actual savings on your energy bills can you expect if you pay to get a radiant barrier installed during construction of your new home? Radiant Barrier roof sheathing appears to reduce summer/cooling loads by about 0.09 kWh/ft² of sheathing, which equals about 180 kWh/yr per home or 3 percent of summer/cooling loads. The extra cost to put the radiant barrier roof sheathing on a 2000 square foot new home is probably around $200. There's no extra labor because they have to put the roof deck on anyway, and the decking with radiant barrier adhered to it (as shown in the photo above) runs about $2 per sheet more than regular OSB (that flaky plywood called oriented-strand board). OK, $200 extra and $25 per year savings means a simple payback of 8 years. But wait, you say, didn't you tell us in another article that payback is irrelevant? Why yes, I certainly did. I'm glad you brought that up. If you're financing the cost of the improvement, then payback is indeed irrelevant. Other measures like cash flow or net present value (discussed in our Energy Efficient Mortgage webinar) would be a better measure of cost effectiveness. Cash flow just means looking at how much you save compared to how much it's costing you, on a monthly or annual basis. If you're saving $25 per year, your radiant barrier would be cost effective as long as your cost to finance it is less than $25 per year. Do you think you could add $200 to your mortgage and have your monthly payments go up less than $2.08? I played around with this using an online mortgage calculator and came in $0.50 ahead per month, so, yes, I think this would be cost effective on the cash flow basis. What that means is that every month, the radiant barrier costs me $1.58 (on average) and it saves me $2.08. I can take that extra $0.50, save it up for 3 or 4 months, and go get myself a cup of coffee! I don't mean to minimize the conclusion here. The point is that as long as the payments you make come in less than the amount you save, it's worth doing. By that measure, radiant barriers would be a cost effective measure for this example (in Houston with electricity that costs $0.14/kWh and a 15 year mortgage at 5% interest). The other important point here is that you have to do the calculations. If your cooling load is not as high as Houston's, your savings will be less. If your electricity rates are higher, your savings will be greater. And then you have to factor in the costs of the radiant barrier, the amount financed, and the terms of your mortgage. Remember also that electricity rates are probably going to continue going up. If you have a fixed rate mortgage, that makes your cost effectiveness improve over time. What's the Payback on Home Energy Efficiency? As usual, I find your articles are informative, thought-provoking and pertinent. These radiant barriers that I have seen appear to be inexpensive when it comes to cost and easy enough to install. With regard to retrofitting a home that is not new, what is your opinion on using radiant barriers and on roofs in various climates, such as in the Northeast. My feeling is that if is is not harmful to the occupants or the structure and it reduces the energy loads, increases durability and energy efficiency, even a small amount, it can be used. Allison - interesting calculations, but I think there are several additional factors in play that affect the value of radiant barriers. I would expect that in a cooling climate with HVAC in the attic that a radiant barrier would provide more savings that Blasnik determined. Regarding homes with no HVAC in the attic, I saw a great presentation by Bill Rose a while back about the same subject. In a set of test buildings he constructed and monitored, in a hot climate, with no HVAC in the attic, and excellent air sealing and insulation at the ceiling line, he determined that the radiant barrier had no measurable effect on the temperature of the conditioned space below. Like many "green" building products, radiant barriers are often a fix for otherwise poor design or construction. But, they are a "thing" that people can touch, feel, buy, and sell, so they are promoted over good design and workmanship. How might you reconcile this with other studies such as FSEC, which report 8-12% reduction in cooling loads? Do you simply choose this study as right, and the other(s) as wrong? That is one thing which can be explained better. A 'free' cup of Joe is appreciated every few months, but the real 'pay-back' can be measured in true value if one has to spend more than 5 or 10 minutes up in the unconditioned attic space more than a couple time per year. Think "$$$weat"! Debra M.: Thanks! I wouldn't recommend putting a radiant barrier in a home in the Northeast. It'll keep the attic cooler in the winter as well, so any summer savings may be offset by higher heating costs. The further north you go, the less cost effective radiant barriers are. G. Curmudgeon: I think Blasnik's data are pretty convincing. They had a huge sample size of relatively new homes. When you mentioned that radiant barriers are "a 'thing' that people can touch, feel, buy, and sell," you forgot to mention what may be their best selling point: They're shiny! I don't really agree that they're just a fix for poor design and workmanship. Lowering the attic temperature does help with cooling loads. M. Johnson: The FSEC study was based on retrofit of existing homes, which have poor performance to start with. Blasnik's report looked at new homes, which was the focus of this article. Joe B.: Absolutely! If I have to go into an attic on a hot summer day, I'd much rather go into one with a radiant barrier. It's better for those people who store stuff up there, too. 3% reduction for a 20 degree attic temp reduction seems low, that must be a properly sealed/insulated home with the HVAC out of the attic. Then again if a house it new construction it should be done that way !! Bob: It does seem low, but I trust Michael Blasnik with this kind of stuff. If you download the report (linked above in the article), you can read about the houses and the other results of the study. I think overall, the houses were insulated and air sealed better than older homes, and, although many of the ducts were in the attic, they were sealed better too. I agree with you that ducts should be inside the building envelope. Here in Michigan we have a few people claiming that they can lower your heating costs 40% by blowing pieces of aluminum or mylar strips into the attic. I'd like to clarify things a little for those who don't want to read the report. All of the homes in the analysis were new Energy Star homes with fairly well insulated attics with ducts - tight and well insulated ducts. The level of savings is actually consistent with reasonable engineering calculations. Savings should be much larger in homes with poorly insulated ceilings and leaky poorly insulated ducts - like in the FSEC study mentioned above. Carl C.: Blowing aluminum or mylar strips into the attic? Really? I haven't heard of that one before. Do you have a link for that? Michael B.: Thanks for the additional info. Can you tell me how many of the homes in the study had radiant barrier rood decking? I couldn't find it in the report. Carl: Thanks for the link. I can't imagine that this stuff comes anywhere near being cost effective. I might write about it in a future article. That part of the analysis was based on 16,408 homes -- 2,010 homes with radiant barrier sheathing and 14,398 homes without. The homes averaged about 2900 sq.ft. in total floor area with 60% having 2 stories. The average area of roof sheathing was about 1900 sq.ft. The savings number was based on a regression analysis of actual bills against a variety of house characteristics. The estimated impact was .09 +/-.04 kWh/sqft -- so there's a fair amount of spread but it seems quite unlikely that the savings are much larger than .13 kwh/sqft. I ran my own engineering calculations and estimated that savings at about 0.12 kWh/sqft -- which is in the same range. Did you note any performance difference for the heating season...with and without radiant barrier? @Michael, glad you pointed out that the homes in this study had ducts in the attic. Without ducts, I'm not sure there's a rationale for RB. In any case, I only specify RB in a handful of markets. As Carl said, much more benefit from emphasizing design, process and QA than getting seduced by product claims. Everyone wants something that's easy. I didn't look at heating use differences -- we didn't have nearly as much gas use data (these were all gas heated) and so i doubt there would be anything to see -- especially given the well insulated ceiling, the small heating loads, and the large impact of occupant behavior on heating in such a mild climate. Degradation (dust collection) will lead to diminishing returns over time - margin too small for long term??? Seems that HVAC must be in attic for true return. What role does shading play? I can envision a production built Houston subdivision with only a three foot tree in the front yard and unblocked sun all day. Thanks for another good piece. Michael B.: Thanks for the details. David B.: I've heard of radiant barrier roof sheathing costing only $1 to $2 per sheet more than regular OSB, and at such a low cost, radiant barriers are cost effective in more locations. The numbers I used above are based on about $3 extra per sheet, and it still comes out ahead. I'm curious to know what the handful of markets you spec RBs for. A Courts: Yes, without ducts in the attic it's hard to justify radiant barriers for financial reasons. They do still help keep the attic cooler and that might be of some benefit even with ducts up there. As you surmise, shading would make them less effective as well because without direct solar gain on the roof, there's not as much heat to transmit. A Courts: That second sentence should read, "They do still help keep the attic cooler and that might be of some benefit even without ducts up there." @Allison, regarding markets, see my first comment @ your previous RB article. I haven't done much price checking, but my assumption has been that $3/sheet is typical. I recently contacted a large stocking building center in central FL and their price to regular customers is currently $2.85. If a client can get OSB+RB for a dollar extra a sheet (< $100 for most homes), sure. Why not. This brings up a larger point regarding efficiency upgrades in general. Without checking prices for everything (who has the time? ), proper analysis isn't possible. And because much of what we deal with falls outside of conventional practice, prices tend to vary widely, even within a given market. So generalizations are of little use for things that are "on the margin". I see Blasnick's study as a confirmation that radiant barriers fall into this category. In particular, I don't see the value of extending the average savings from a large study to any given home. One more thing that struck me. The average cooling intensity for ES homes in this study (Fig.1) is way more than any of the hot climate projects I've worked on in recent years. Most of the homes were built before the TBC and duct leakage threshold were introduced with v2 in 2006. And even with v2, there's no infiltration threshold or window shading requirement. In hot climate zones, if you attend to these basic things, plus ensure a tight ceiling and move HVAC out of the attic, cooling intensity will drop dramatically, along with the savings associated with a radiant barrier. We need to keep our eye on the big stuff, and don't sweat the little stuff. I have wondered about the tradeoff of summer benefit to winter loss of heat from the sun. This was mentioned in this trail. To install radiant barrier in an existing home in the Dallas, TX area it seems like there could be just about as much loss of heat in the winter as prevention of it in the summer. Any comments on that? Ideally, a product could be rolled back in the winter so it doesn't block the heat desired and rolled out in the summer when wanting to repel it. Thanks. There is reference to a space being needed for the radiant barrier. Presumably that means between it and the decking. For an existing house then, would the roll out foil installed on the bottom of the trusses be a good application? A most curious observation found on page three. The cooling load attributable to duct leakage is no greater than the amount of savings attributable to radiant barrier. Does anyone else find this an incredible claim? "...Building envelope leakage appears to be responsible for about 14 percent of summer/cooling loads while duct leakage only appears to account for about 3 percent of summer/cooling loads..."
Living in the Houston area, I can pretty much guarantee you these ducts are mounted in unconditioned attic, along with HVAC equipment. Please explain to me how these claims can be plausible. It really shouldn't be much of a surprise. These are Energy Star homes and the ducts are tight. 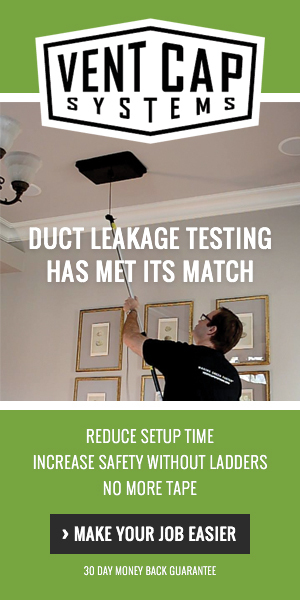 If the ducts don't leak, there isn't much energy wasted from duct leakage. Please help me out here. What was the Energy Star requirement for duct leakage in those years? David B.: Yes, we definitely need to keep our eyes on the big stuff, but as we take care of those things, the small things matter more. I do see value in this analysis and using numbers from the Houston study to provide some general guidance. What I hope readers take away from this is that radiant barriers can be cost effective, but it's close. Yes, you have to check the local prices on material and still attend to all the other details, but if radiant barriers save you more than they cost you, use them. Thanks for continuing to raise the level of discussion here, David! Suzanne: I wouldn't worry about a radiant barrier's effect on heating loads in Dallas. With an outdoor design temperature of 98° F and only about 1500 heating degree days, summer is going to be more important for you. Yes, there needs to be a gap. Actually, putting the radiant barrier below the rafters/truss top chords is the best place, new or existing. They don't do it in new homes, though, because of the extra labor. M. Johnson: Until Version 2 went into effect in 2006, ENERGY STAR didn't have a duct leakage threshold. Since '06, it's been 6 cfm25/100 sf outside the envelope. With Version 3, the allowable leakage outside the envelope drops to 4 cfm25/100 sf. So, the homes in the Houston study had a mix of those that had to meet a threshold and those that didn't. Mostly, they still had to have tight ducts to get the HERS Score they needed to pass though. The total duct leakage to outside averaged 86 cfm25 in the homes in the analysis. So does this not come close to voiding the conventional wisdom that that putting ducts and equipment in conditioned space is important to efficiency? M.Johnson, even if ducts are as tight as these (a big IF for homes not being tested), there's still conducted heat transfer. Let's say the delta-t across the coil is 20F and the supply air is 55F. If the supply air picks up 4 degrees by the time it reaches the room, you've lost 20% of the capacity to the attic. That's huge. And it's typical. This post and the comments are really very informative. I learnt so many things about Radiant Barriers, thanks. @Mr. Blanik: you said "The total duct leakage to outside averaged 86 cfm25 in the homes in the analysis." My first impression was you were much more thorough and perceptive than I in reading this report. Now that I have read the section you reference, I must dissent. I have not found anywhere in the report which tells us the actual measured leakage. What I did find was a section which said the 86 CFM25 was IMPLIED by the low correlation in their model. These homes are in the Houston area where such low leakage ought to be headline news for the Building Science community. I just need to see some more data before I can believe Houston is on the high end of any part of construction quality, especially regarding duct work. By association I hold out the possibility this report might not be based on a correct model, and when duct leakage is restated to a more correct number, the number for radiant barrier might not remain at 3% either. To me neither passes the intuitive baloney test. @Mr. Butler: when you said "...Let's say the delta-t across the coil is 20F and the supply air is 55F. If the supply air picks up 4 degrees by the time it reaches the room, you've lost 20% of the capacity to the attic..."
Your principle is very true. Now please consider with that the statement that RB (radiant barrier) can replace attic temperatures by up to 20 degrees. That would seriously reduce the delta-T between duct and attic air, and I wonder if you can maintain the plausibility of RB benefit only ~3% given this consideration. P.S. Please forgive the all-bold typeface in my previous post. My intent was to only bold what was quoted, then evidently it did not turn off the way I thought it did. M. Johnson - I seriously doubt that I am misinterpreting the report - I wrote it. The 86 cfm25 duct leakage is the average measured value - not some sort of estimate. I don't understand why you think such a value isn't reasonable -- these are all Energy Star homes where duct leakage was being tested. Do you think ducts can't be made tight? The 3% figure is reasonable from both an engineering perspective as well as being supported by the data. Also, David Butler's example of 20% heat gains from conduction are nearly twice as large as you would expect for R-6 ducts and M Johnson's estimate of a 20F reduction in attic temperature may be in the ballpark for peak temperature but the average temperature reduction will likely be less than 5F because of a phenomenon known as night. FSEC measured about a 3F average decline. Michael: I'll buy that 20% may not be typical for seasonal average, for the same reason you cited for radiant barriers (night vs. day, average, vs. worst case). My comment was misleading in that sense. My point was that conducted losses are also at play, which M.Johnson seemed to ignore by suggesting that the good leakage results of the study somehow refute the notion that attics are a bad place for HVAC. M.Johnson: Regarding attic hvac, there's another factor at play that's often overlooked: every time the system cycles off, the air in the ducts and the mass of the AHU and duct system heat up. This thermal inertia must be overcome at the beginning of each cycle. The larger the system (relative to load), the more on-off cycles, and the more effect this has on overall efficiency. Regarding the impact of radiant barriers on ducts, keep in mind that attic ducts are (or should be) located just above the insulation, not at the peak of the roof (upflow duct octopuses should be outlawed). So when evaluating the benefit of a RB, one must consider the temperature where the losses occur, not at the peak of the roof. My home does not have a RB. I monitored temps at the top of the insulation last summer and found the daily peak temperature (T-max) never exceeded 25F above the day's high temperature. The T-max trendline is slightly less than 20F above the daily high. That being said, 115F or 120F is still hot enough to cause serious efficiency losses in my hvac system. Very useful info. Working on plans now to build new home in Louisiana. Will probably add in the cost of RB since we are starting from scratch. Getting Christmas decorations out of the attic at Thanksgiving can be brutal here as it may well be 95 degrees. Energy savings for home and body should be considered this far south.